I’m Back *Exhales Deeply* – Writer. Traveler. Tea Drinker. Looking down at New York and central park. So before I go into what it’s like at my new job I thought I’d do a quick wrap up post on my summer in America. I’ll admit the first half was rough. To save money I stayed at my mom’s house, a town I no longer have many friends, and didn’t do much. I wasn’t happy to be back and everything was bugging me, especially the food. I had a non-stop stomach ache for almost the whole time, though eventually it got better. I missed China, I missed my friends and the summer seemed so damn long. Not all was lost though, I did make some new friends, and I made a few trips to see friends in various parts of New England. I also got to spend a bunch of time with my brother and his kids. The second half though, was better. Jason came, and he likes to take credit for making the trip better, but actually that wasn’t it. Something in me clicked. Partially it was the culture shock wearing off, partially the fact that I was seeing friends again, but I began to appreciate the places I had lived. You see, I was sick of my hometown, and sick of all the same old thing when I left. And every time I have been back since then I felt like nothing had changed and everything was still boring. But now 5 years have passed, I’m beginning to appreciate the fact that nothing changes and everyone is the same. I went to the library, the bookstore, the post office and ran into people that I really like. So, overall, I didn’t hate it. I don’t suddenly feel all warm and fuzzy about going home (It will be at least 2 or 3 years till I go back again) but it wasn’t the nightmare that it had been in the past. It was good to see everyone again, and do things like eat turkey and Ben & Jerry’s. One thing I appreciated, the whole time, was the beautiful sky. It seemed crushing at times, but the colors it presented was amazing. Since I had plenty of free time on my hands in the first month, I went into New York several times. At the NY Public Library they had a display of children’s books including the ORIGINAL Winnie-The-Pooh dolls. Like, the one the real Christopher Robin played with and the books were based on. Ah-maaazing. I got to spend a lot of time with my nephews. They’re finally at the fun age where I really liked hanging out with them. When I see them next time, they’ll be teenagers! Scary. Jason finally came forcing me to go out and about and do touristy stuff. This was us on our way to see the Statue of Liberty and Ellis Island. In my hometown in NH, My friend Liz was nice enough to cook a homemade italian dinner for us. Beforehand she tried to make me feel guilty for forcing her to bake in the hot summer, but the weather was unseasonably cool and it wasn’t an issue. But her lasagna, and homemade meatballs (with sausage) was sooo good. She also has some new gardens and this was her first cucumber, fresh off the vine. 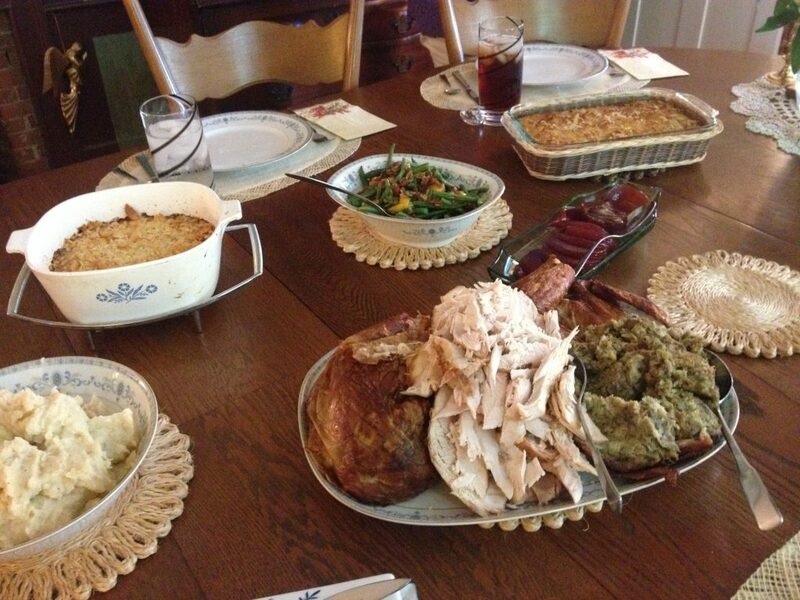 As if that wasn’t enough, I asked my friend Beth to cook a Thanksgiving dinner. You see, for several years when I was still in America I always went to Beth’s house for Thanksgiving, Christmas, Easter and any other special holiday dinner. Her cooking is amazing, and I haven’t had a turkey dinner for 5 years. She went all out, cooking several casseroles, mashed potatoes, fresh rolls and veggies in addition to the turkey. She also made a pumpkin pie and chocolate pecan pie for dessert. We invited a bunch of people over and had a real thanksgiving dinner, complete with saying what we were thankful for. (I was thankful I had friends who were willing to cook a dinner like that for me.) I was staying at beth’s house, so I ended up eating leftovers for breakfast for the next two days, including the pies. I will dream of this dinner for the next 5 years until my next thanksgiving dinner. So that was my summer. Now, eyes forward to look at the future. Next post? My new life in China! I used to feel the same way about my hometown in Maine – always sick of the same ol’ thing. Although, I’ve met people from away taking their entire lively hood just to live in my state and it gave me a whole new appreciation where I’m from. It was kind of nice to have people loving the new life they gave themselves in the state I grew up in. I haven’t been back there since 2009. I now left China and back in Taipei and I really don’t know where I will be going next, but I will be looking forward in reading your future adventures in China. (I have to admit, I do miss Boston. I used to visit for relatives – ah well). I also have the same ambivalent attitude when go back “home”. I don’t know if it’s the same for you but for me it’s because it makes me feel as if I hadn’t achieved anything meaningful in life, and this feeling is made worse when I see that nothing much in my hometown has changed and everything just seems “bleh”. Anyway, looking forward to reading about your new adventures. E-phoenix, yeah I know exactly what you mean. I’m not one to go back in life, it makes me feel stalled or something. Everyone at my last school was really nice and said I could come back anytime, but truth is I never would. Even if I hated it in the new place, I’d find another new place rather than go back to somewhere I’ve already been. And Eileen, maybe it will make you feel better to know that Boston hasn’t changed at all. My friend said “Boston’s probably totally different since you’ve lived here.” And I was like, “Nope. It’s exactly the same!” Some of the stores have changed, but there isn’t anything new and major in the city at all, haha.